Presented here is a timeline of Jewish life in Rohatyn between the World Wars, i.e. from 1918 to 1939. Although often labeled “interwar”, the period was not without its own wars and other armed conflicts, in Central Europe and even in Rohatyn. Nonetheless it was a time of rapid evolution of the Jewish community, distressed by global economic collapse and regional ethnic pressure, but brightened by social organizations and fellowship, and broadening the exchange of ideas with their peers in Europe and beyond. The growing emigration trends also changed life for Jews who remained in Rohatyn, and spread awareness of Rohatyn to America and Palestine. 1918 Nov 1 – With empires collapsing across central Europe in the last days of World War I, Ukrainian military units take control of Lemberg/Lviv/Lwów and declare the formation of an independent West Ukrainian People’s Republic comprising eastern Galicia and some of the lands surrounding it with large ethnic Ukrainian populations; Lviv is declared the capital. Within days, a new Polish-Ukrainian War has begun, before the conclusion of the Great War of the past four years. 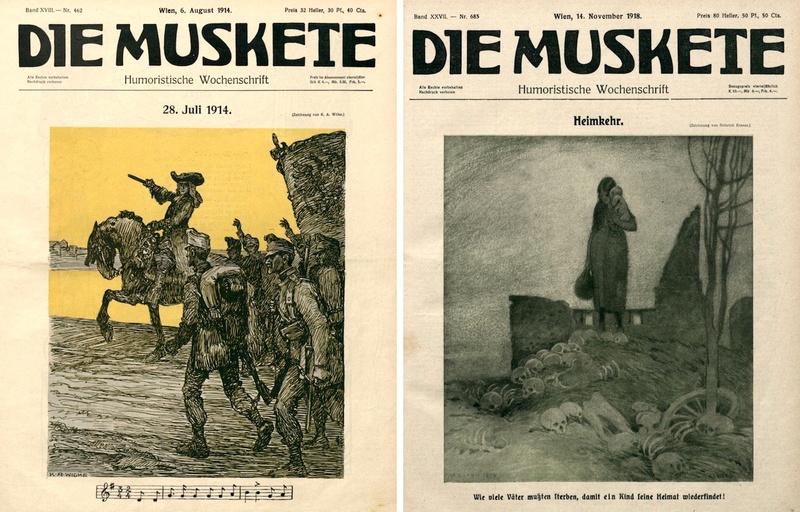 The Austrian view of the war, at the start and at the end, as seen in the Viennese “humorous weekly” The Musket: at left, the call to arms in early August 1914; at right, “Homecoming” a few days after the armistice was signed in November 1918. Source: ANNO. 1918 Nov 11 – An armistice is signed between the Entente Powers and Germany in a carriage of Ferdinand Foch’s private train in the Forest of Compiègne, 60km north of Paris. The fighting of World War I ends at 11am, and the prospects of new independence for Poland and Ukraine seem strong, but many territorial issues remain openly disputed. 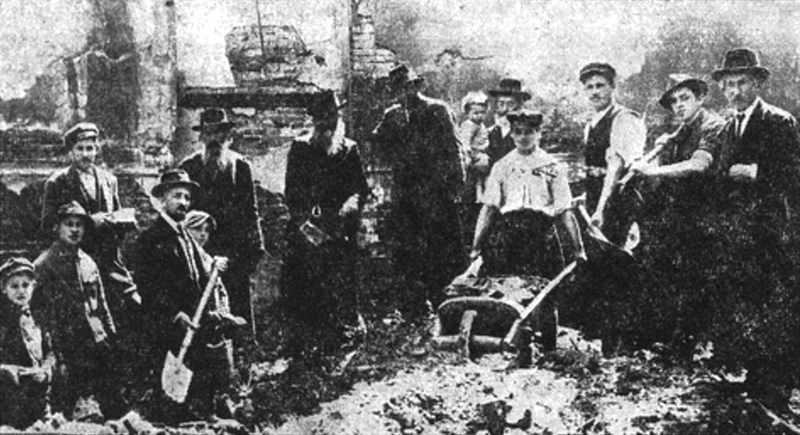 1918 Dec 27 – An uprising of ethnic Poles breaks out in Poznań, challenging German control over lands which had been part of Prussia since the Partitions. Fighting will continue despite a truce and to mostly Polish advantage for seven months. 1919 Jan 18 – The Paris Peace Conference opens in Versailles with a program to resolve the open issues from the recently-ended war: reparations, mandates, and revised state boundaries to better represent ethnic boundaries. 1919 Jan 22 – The Ukrainian People’s Republic and the West Ukrainian People’s Republic sign an “Akt Zluky” symbolically creating a unified Ukrainian state. Civil war continues for several more years between several Ukrainian political entities plus Bolshevik Russian forces, all claiming control of the territory. 1919 Feb 14 – After isolated skirmishes related to Soviet Russia’s westward expansion efforts, serious hostilities open between Poland and Russian armies in Belarus. Over the next two years, the Polish-Soviet War will harden and escalate, with the front reaching across most of eastern Poland and western Ukraine. 1919 Mar 10 – At the conclusion of the 3rd Congress of Soviets in Ukraine, with support from Bolshevik Russia and in opposition to Ukrainian nationalists fighting for independence, the state is named the Ukrainian SSR. Nine months later, when a new Ukrainian Soviet government is formed, the Red Army controls much of eastern and central Ukraine. 1919 May 27 – A two-week Polish offensive in eastern Galicia forces the withdrawal of the Sich Riflemen, breaking Ukrainian lines and capturing Rohatyn and other towns west of the Zolota Lypa River. [1, Polish-Ukrainian War] The Entente intervenes again, this time to stop Poland, as Polish mobs and renegade military units conduct anti-Jewish pogroms in newly-taken areas. 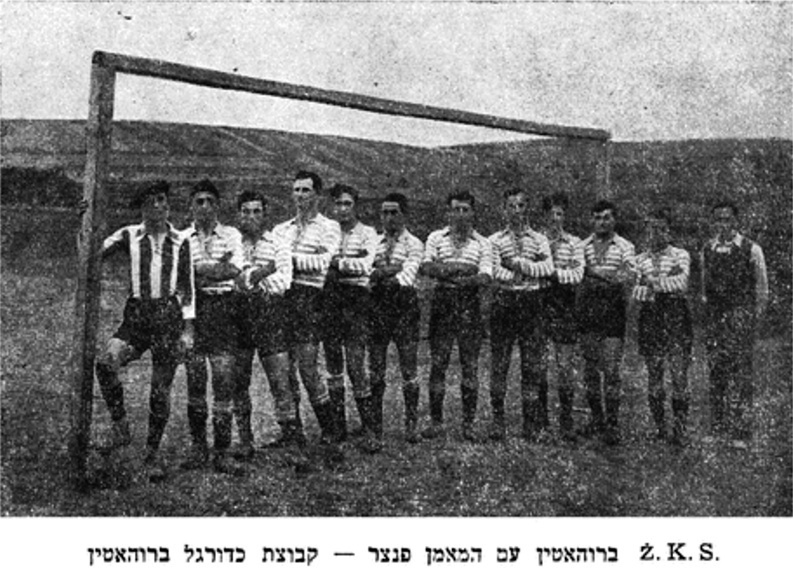 Part of the Jewish Kurin in 1919, with Solomon Leinberg at center front. Source: Wikimedia. 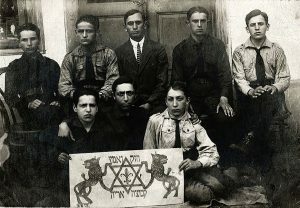 1919 mid-Jun – A Jewish strike battalion is formed in the Ukrainian Galician Army from university and high school students in the Ternopil area, under the leadership of Lieutenant Solomon Leinberg. The kurin enters battle in mid-July, initially fighting against Polish forces to the west and later against Red Army forces to the east. By the end of the year, casualties and typhus decimate the battalion, and surviving Jewish soldiers are dispersed among other units; Leinberg’s fate after 1919 is unknown. 1919 Nov 30 – “Galicia Swept by New Wave of Typhus” reads the headline on an article in The Sacramento Union, a daily newspaper published in far-away California. The article, datelined in Lemberg, reports a rapidly-spreading epidemic which has already killed hundreds of people in villages, in large part due to the destruction of medical facilities and the depletion of supplies over five years of constant warfare. Medical leaders are aghast at the intensity of the situation, which “eclipses anything ever known in this land where typhus has always been more or less epidemic,” and express fear of unprecedented death rates in the coming winter, traditionally the peak period for the disease. 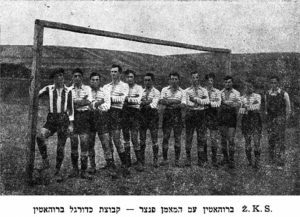 The Aryeh club in Rohatyn of HaShomer HaTzair, 1919. Source: Leo Baeck Institute. 1920 Jan 10 – The League of Nations is formed as an intergovernmental organization whose mission is to maintain world peace. 1920 Apr 21 – A military-economic agreement is signed between Poland’s chief of state Józef Piłsudksi and Symon Petliura, chairman of the Directorate of the Ukrainian People’s Republic, as allies against Bolshevik Russia in ongoing conflicts to Poland’s east. 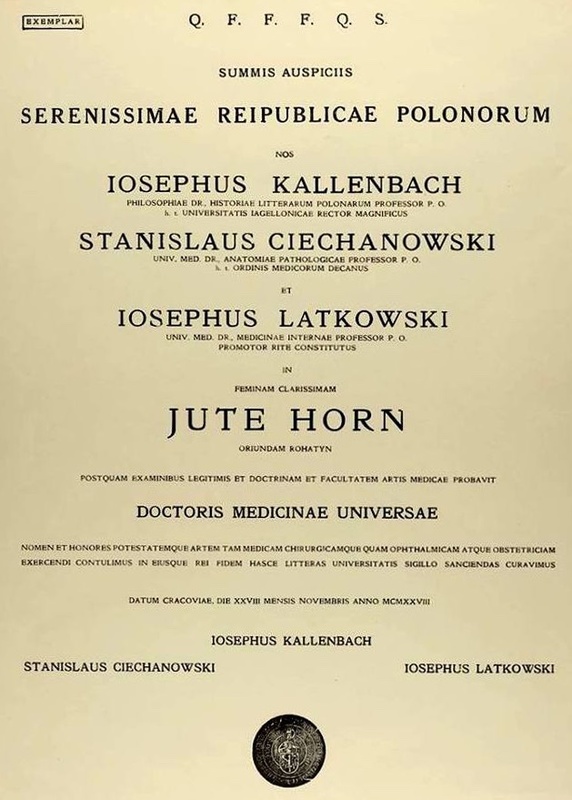 1920 Spring – Records at the University of Vienna list Jute Horn, a Jewish student from Rohatyn enrolled in the medicine department, as a Ukrainian citizen. This may come as a surprise to her parents back home in Rohatyn. Over the previous few years while Jute has been away, her citizenship has previously been recorded as Polish (fall 1919), before that German-Austrian (spring 1919), and before that Austrian (to fall 1918). The Horn family has of course remained in Rohatyn the entire time, while borders and control have changed repeatedly. The cast of King Lear, performed by a Rohatyn Jewish theater group. Source: Faust Family Collection. 1921 Mar 17 – Poland adopts the “March Constitution” as its first full definition of the state since returning to republic status. 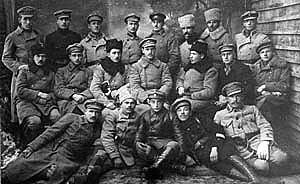 1921 Mar 18 – The Peace of Riga concludes the Polish-Soviet War; although directly affected by the territorial issues, non-communist Ukrainian representatives are excluded from the negotiations. Among other agreements, Poland’s eastern border is established about 250km east of the Curzon Line at the Zbruch River, so that Rohatyn and all of eastern Galicia becomes Polish. 1921 Sep 30 – The first Polish census reveals the impact of World War I and the deadly 1918~1919 influenza pandemic on Rohatyn and its Jews: for the first time since Rohatyn’s populations have been counted, the number of Jews has dropped, and significantly so, by more than 30% since the last Austrian count in 1910. Also for the first time since probably the early 19th century, Jews make up less than 40% of Rohatyn’s total population. In the coming years, Rohatyn’s Jewish population will grow, but slowly, and more slowly than other ethnicities in the town, so that the Jewish portion of the town’s population will continue to fall. This trend reflects a number of causes, but emigration from Rohatyn and Poland remains significant until the outbreak of WWII, with destinations on many continents but especially overseas, with primary goals of British-controlled Palestine and America. 1922 Apr 3 – Joseph Stalin is named first General Secretary of the Communist Party of the Soviet Union; in less than 10 years he solidifies his position as de facto leader of the Soviet Union. 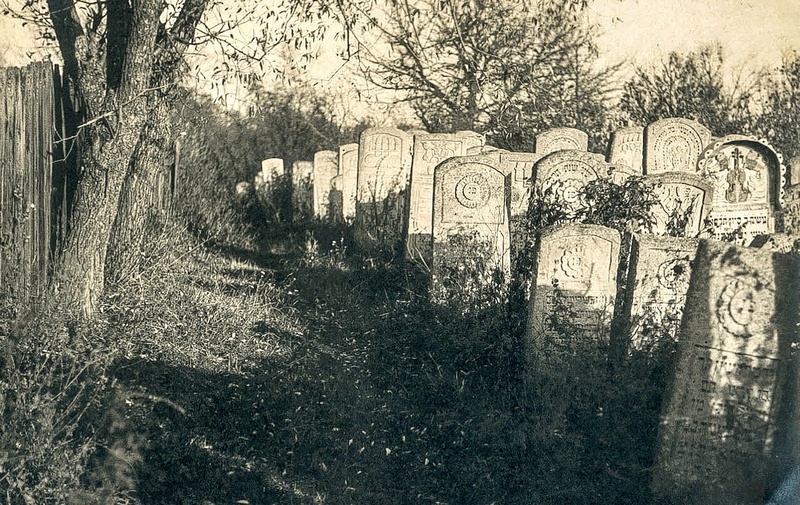 The old Jewish cemetery in Rohatyn, probably before the 1920s. Source: Tomasz Wiśniewski Collection. 1922 Dec 28 – Delegations from four Soviet socialist states, including Ukraine and Russia, meet in Moscow and approve a treaty and a declaration establishing the Union of Soviet Socialist Republics (USSR, or Soviet Union); in time, 15 Soviet states would become part of the federation. 1923 Sep 29 – The League of Nations grants Britain a mandate to administer Palestine in the defunct Ottoman Empire until the territories could “stand alone”. Among other provisions, the mandate implemented the goals of the Balfour Declaration of 1917, establishing a national home for the Jewish people in Palestine, and empowering the Jewish Agency for Palestine. 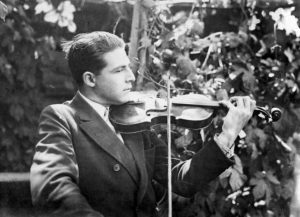 1923 Oct 7 – The art section of The Jewish Daily Forward in America publishes what will become one of the best-known photographs of Jewish musicians in interwar Poland, the Faust Family Klezmorim of Rohatyn. Julius Steinmetz from Rohatyn, in his grocery shop in the Bronx (US), 1924. Source: Steinmetz Family Collection. 1924 – Jewish emigration from Poland continues. Skilled and unskilled Rohatyn families establish new homes in Palestine, North and South America, western Europe, and elsewhere. 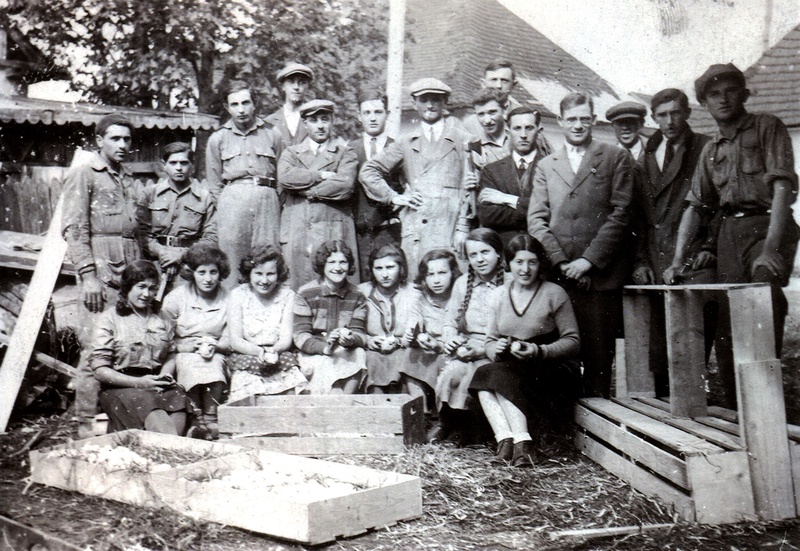 Once established, some of the emigrants will return to Rohatyn to take other family with them to their new homes abroad. 1926 May 25 – Symon Petliura is assassinated in Paris by Sholom Schwartzbard, a Russian-French Jewish anarchist. 1926 Oct 14 – A unique gift is presented by Poland to America: Rohatyn schools participate in a state-wide “Emblem of Good Will” declaring the admiration and friendship of newly-independent Poland for the United States of America, in the year of America’s 150th day of independence (04 Jul 1926). Students and teachers in elementary and secondary schools (gymnasiums) in more than 70 towns and villages in the Rohatyn district join 5 million others in Poland in signing and sending their greetings across the Atlantic ocean. 1927 Dec 8 – An evening concert is held at Rohatyn’s rebuilt Great Synagogue featuring a performance of the Maariv (evening) religious service together with Hebrew and Yiddish religious songs plus the popular Yiddish theater tune Eli, Eli, all sung the by the 11-year old alto L. Fajerman. The library and records office of the Eretz Yisrael Verein (Society for Israel) in Rohatyn. 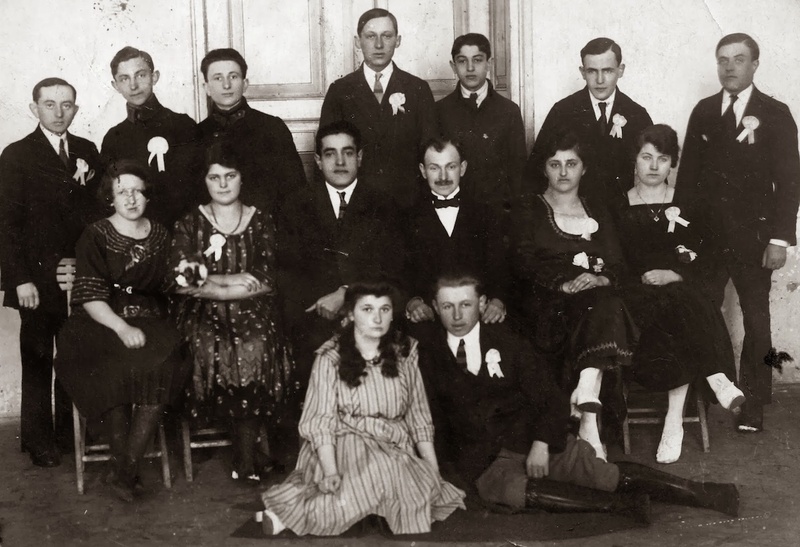 1927 – Rohatyn municipal elections include one Jewish party; by agreement with local Poles and Ukrainians, Jews are granted 16 of 48 council seats. Local lawyer Dr. Samuel (Shmuel) Goldschlag is elected Rohatyn’s vice mayor. The Jewish community of Rohatyn is now a recognized part of the town’s civil affairs, directly participating through leaders without separate Jewish councils – the kahals, which have been diminishing since the years before the Great War. Alternatives to a kehillah in the form of community-wide legal and social organizations, for example to administer the cemeteries in town, continue to function in Rohatyn (as evidenced from surviving photos of a local library [4, p.110] and legal records in modern Ukrainian archives), but the lost influence of Jewish councils is clear from the almost complete absence of mentions in the Pinkas ha-kehillot Polin and Kehilat Rohatyn v’hasviva and other memoirs of Jewish life in Rohatyn. 1928 Aug 27 – Germany, France, and the US are the first states to sign the General Treaty for Renunciation of War as an Instrument of National Policy (aka the Kellogg-Briand Pact); Poland and most European, Asian, and North and South American states sign soon after. The Pact is an international agreement which renounces the use of war and calls for the peaceful settlement of disputes. Although the pact has not prevented war, it has established that the threat or use of military force, and acquisition of territory as a result of it, contravenes international law. 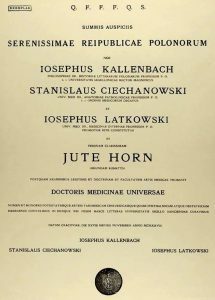 Jute Horn’s medical diploma, 1928. Source: Jagiellonian University Archive. 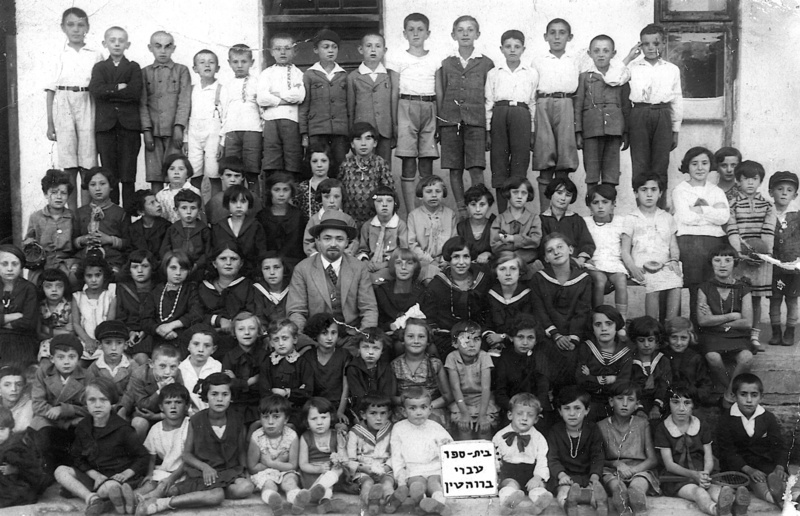 A Rohatyn Hebrew school class in the 1930s; its teacher, Mr. Edelstein, is at center. [4, p.188] Source: Faust Family Collection. 1931 Dec 09 – A second Polish census is taken; the results are analyzed and published in sections over the next years, but only for state and district counts, as European events toward the end of the decade disrupt progress on the detailed summaries for towns and villages. 1932 – Fanny Holtzmann, an entertainment lawyer from Brooklyn, travels to Europe and visits the Rohatyn, the town where her mother Taube was born. She brings with her a movie camera, and captures two and a half minutes of live film of the town and its people. 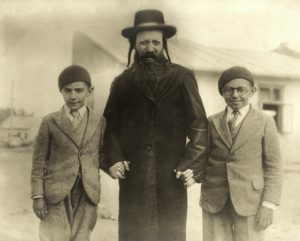 Renowned Rabbi Meyer Shmuel Henne poses in Rohatyn with his visiting grandsons, 1932. Source: Henne Family Collection. 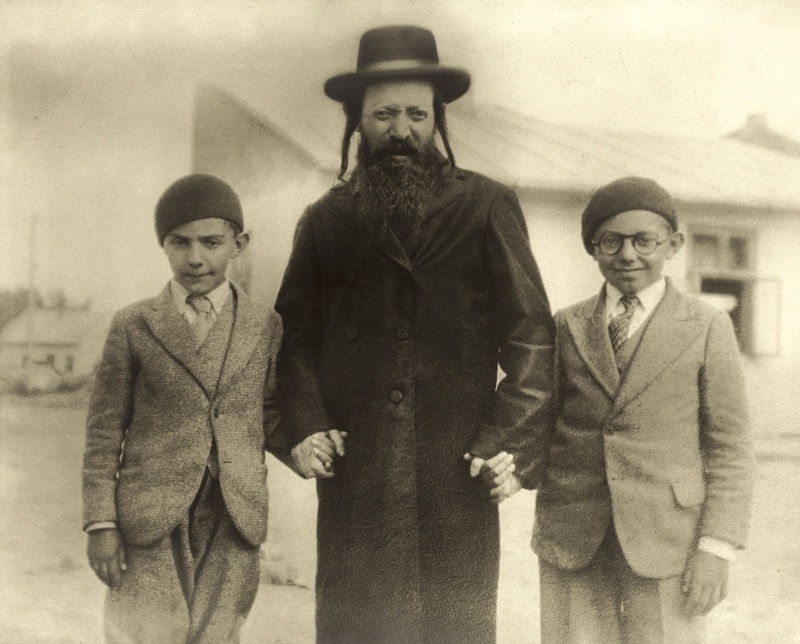 1932 – Sam Henne, a son of Rabbi Meyer Shmuel Henne of Rohatyn who had emigrated to America on the eve of World War I, returns to his home town; he brings his sons Harvey and George to meet their grandparents. Photos are taken to commemorate the reunion. The rabbi tries to convince his son to stay and continue the long family tradition of religious leadership in Rohatyn, but Sam returns with his sons to America. Over the next several years, other emigrant and descendant Rohatyn Jews abroad like Fanny and Sam return to visit Rohatyn, but few or none return for more than a visit. 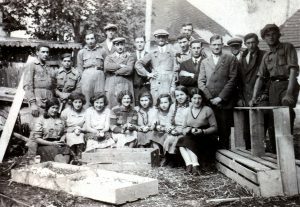 Egg packing in Rohatyn, interwar period. There was a Jewish wholesale egg distributor on the rynok during this time. Source: Steinmetz Family Collection. 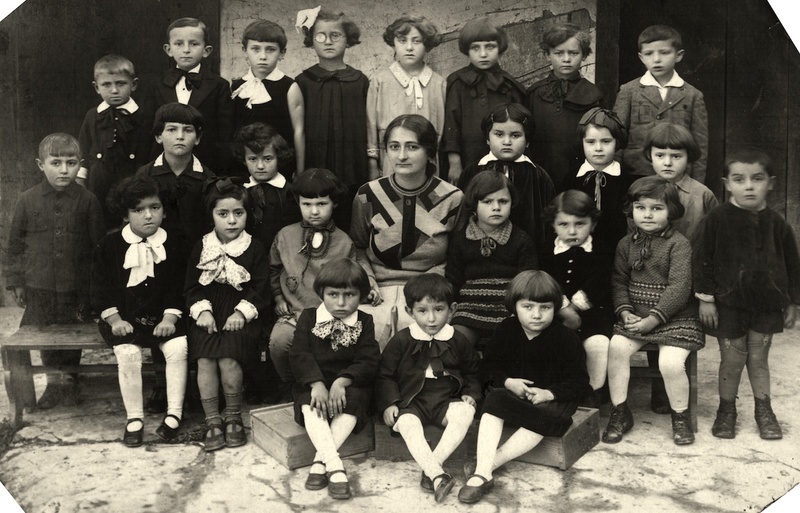 1930s – Increased contact between traditional Jewish families in Rohatyn and their relatives abroad accelerates the spread of modernity in dress, gender roles, and social interactions. Educated Jewish women find professional work, but even women with less education are able to join men in factories and other less traditional workplaces, as Jews in Rohatyn expand their focus beyond shops and small-scale trading. Many images from the period show Rohatyn Jews sharing more of the informal and egalitarian focus of greater Europe (and Palestine) than the more formal and inward focus of the recent past, in their clothes and especially in their attitudes as captured by the camera. 1932~1933 – A catastrophic, man-made peacetime famine kills millions of Ukrainians as part of extensive Soviet famines in grain-producing areas of the USSR, east of Poland. The disaster, known as “Holodomor” in Ukrainian, overwhelmingly strikes ethnic Ukrainians; the demographic collapse is worst in rural areas, retarding Ukrainian economic, social, and health development. The Soviet action is now (2008) recognized by the European Union as a crime against humanity; in 1953, Raphael Lemkin labeled it Soviet genocide . 1933 Jan 30 – Following a nationalist coup against Prussian leadership, two national elections in Germany in 1932 fail to produce a new stable government, and Reich President Paul von Hindenburg appoints Adolf Hitler as Reich Chancellor, although Hitler’s NSDAP (Nazi) Party had taken only 33% of the last vote. 1934 Jan 26 – Poland signs a 10-year non-aggression pact with Nazi Germany. 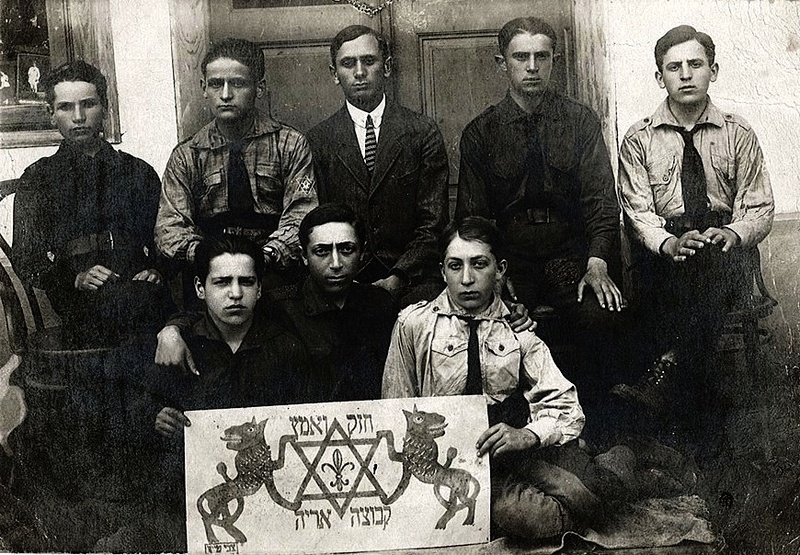 1934 Jul 1 – The adjacent village of Zaluzhzhia is joined to the city of Rohatyn for administration, adding more than 1000 people, of whom perhaps 20 are Jewish. 1934 Jul 25 – The Chancellor of Austria, Engelbert Dollfuss, is assassinated in Vienna in a failed coup attempt (labeled the July Putsch) by Austrian Nazis including Otto Wächter. Passport images of the Horn sisters Jute and Bronia. Source: JHI, Horn and Hornstein Family Collections. 1934 Aug 7 – Now married and having worked as a dentist for five years in nearby Chodorów, Jute (Horn) Teichmann of Rohatyn leaves Poland via Sniatyn (at the border with Romania since the end of WWI), en route to British Palestine; although she continues to travel after establishing residence in Haifa, she will never return to Rohatyn. She is part of an ongoing exodus of Jews from Poland, making aliyah (“ascent”) for many reasons, increasingly because of mounting restrictions against Jews in academic, professional, business, and civil service positions for admissions, licenses, and permits. Jute’s younger sister Bronia, working as a teacher of German language and literature in Busko-Zdrój, will follow the same path out less than two years later, after a “paper marriage” to a Rohatyn family friend, enabling her a passport and exit visa to Palestine. 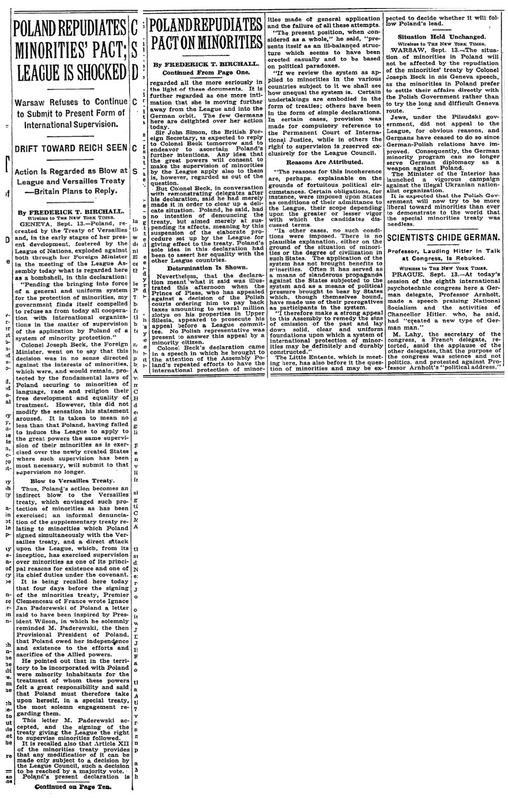 The New York Times reports on Poland’s shocking minorities decision, 14Sep1934. 1935 Apr 23 – Poland adopts the “April Constitution”, undermining the state legal foundation established after World War I and concentrating significant authority in the new post of President. ca. 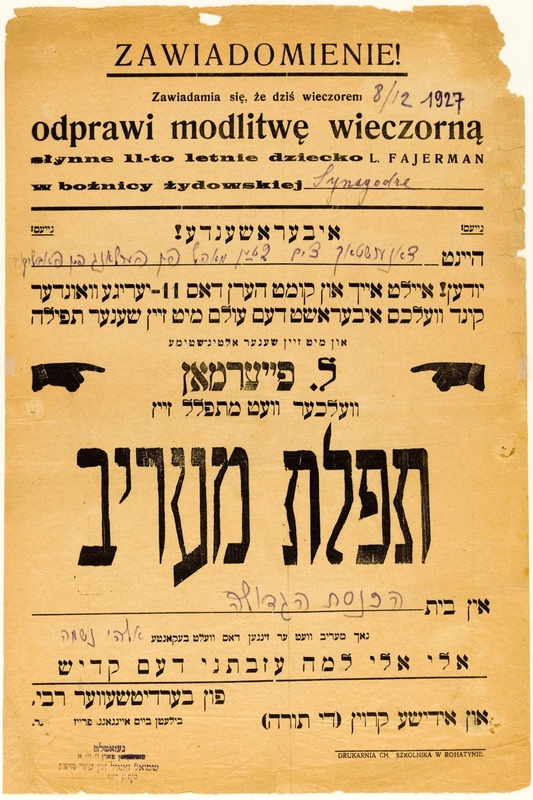 1935 – Despite external political and social pressures in Poland and abroad, Jewish life in Rohatyn continues with many of its traditions, some now integrating with the modern and more urban world. Yosef Blitz, a violinist born in nearby Bukachivtsi and who studied at the renowned music conservatory in Lwów, marries into Rohatyn’s famous Faust klezmer family. 1935 Dec – Three months after Germany introduces the antisemitic Nuremberg Laws, Lwów Polytechnic university officially sanctions segregationist Jewish ghetto benches. Following objections and legal challenges, the order is canceled by the university’s academic senate two months later. Numerus clausus rules are also informally introduced, effectively limiting the number of Jewish students at the universities to a fraction of earlier numbers. 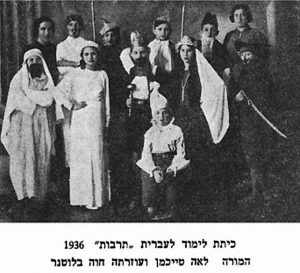 1936 Mar 8 – Some things resist change, and some traditions become more meaningful in difficult times: In Rohatyn, the Jewish holiday of Purim is celebrated, commemorating the role of Esther, the Jewish wife of the King of Persia, in protecting all the Jews of the empire from murder by the king’s viceroy. Gifts of food and drink are exchanged, charity is given, and the Megillah is read in synagogues. Children dress the parts of the legend, and perform versions of the story for their parents and schoolmates. 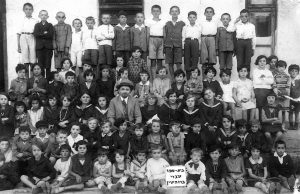 1937 – Young children continue to enter kindergarten in Rohatyn, and begin what they hope will be a long and interesting time as students. 1937 Oct 5 – After students and other members of Poland’s National Democracy (Endecja) political movement pressure the Ministry of Education to grant individual universities the right to regulate Polish and Jewish benches in lecture halls, Warsaw Polytechnic re-introduces ghetto benches; soon after, many other Polish universities follow suit. The rector of Lwów University resigns his post in protest, but the vice-rector signs the order the next day. Some Polish students refuse to sit at their benches during lectures, standing in protest at the treatment of their Jewish colleagues. In December, 56 top professors at Polish universities sign a letter of protest against ghetto benches, but the order stands until the start of World War II. Rohatyn Jews at work. 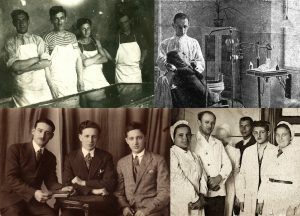 Clockwise from top left: Some of the many butchers, dentist Yosef Teichman, workers at a Jewish-owned restaurant, and young Hornstein men in suits tailored by their seamstress mother. Sources: Steinmetz Family Collection, Rohatyn Yizkor Book, Glotzer-Barban Family Collection, Hornstein Family Collection. 1930s – Despite restrictions at higher levels, Rohatyn Jews join professions and help to make Rohatyn a regional business center. 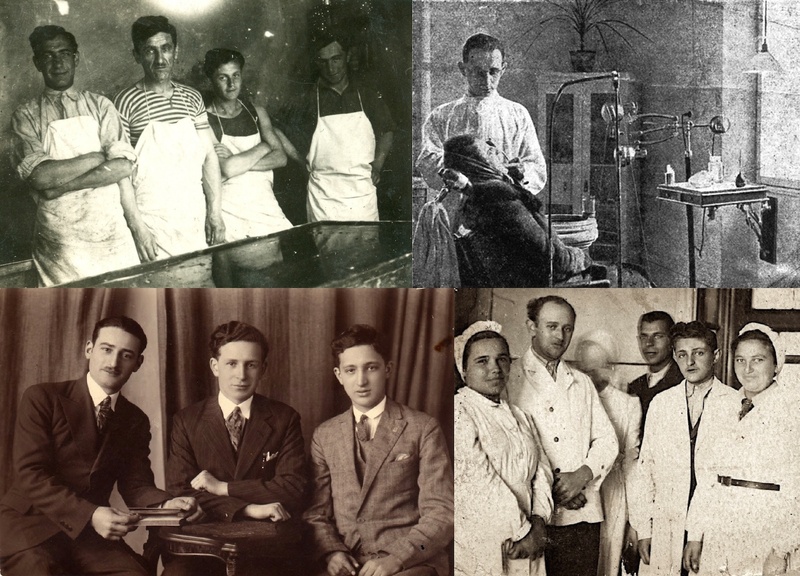 A wide variety of records show many Rohatyn Jewish families are engaged as journalists and printers; doctors, nurses, and midwives; barbers and pharmacists; lawyers; teachers; architects; tailors and seamstresses; butchers, bakers, restaurant and saloon owners; and painters. On the other hand, many Jewish families in Rohatyn and the area continue as merchants, traveling between the towns on carts, and moving onto the market squares to establish shops. 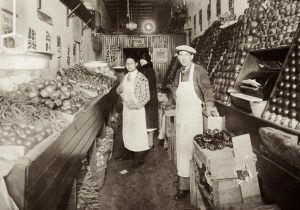 In the 1930s, products sold by Jews on or near the Rohatyn market square include wholesale and retail groceries, eggs, breads and cakes, candies, medicines, textiles, alcoholic beverages, tobacco, fresh meats, shoes, men’s clothing, furs and winter clothing, books, pots and pans, hardware, plumbing supplies, newspapers, and gas and oil for automobiles. 1938 Mar 12 – The day before a scheduled Austrian referendum on independence, German Wehrmacht troops cross the border and seize control of the state. Adolph Hitler arrives in Linz the same evening. Surprised by the enthusiasm of the welcoming Austrians, rather than install a puppet government, Hitler decides to annex Austria to the German Reich, as an Anschluss. Actions against Austrian Jews begin immediately after. 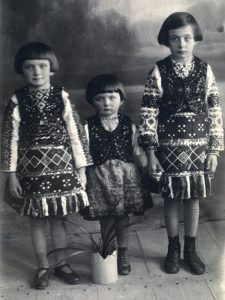 Young sisters from a Rohatyn Jewish family, in Ukrainian folk dresses likely sewn by their mother. Source: Schnytzer-Wald Family Collection. 1938 Nov 7 – German diplomat Ernst vom Rath is assassinated in Paris by stateless Jewish teenager Herschel Grynszpan, whose Polish-born, German-resident parents had been stuck without shelter for 11 days among 17,000 other Jews at the then-border town of Zbąszyń due to expulsion from Germany and the Polish revocation of citizenship from their foreign residents. 1938 Nov 9~10 – In retaliation for the murder of vom Rath, German SA paramilitary forces and civilians throughout “reunified” Germany conduct a violent pogrom against Jewish businesses, synagogues, and individuals. For the shattered glass littering streets around broken windows and burned buildings, the event is labeled Kristallnacht. In addition to the damage to more than a thousand buildings, many Jews are injured and more than 30,000 Jewish men are arrested and sent to concentration camps in Germany. early 1939 – The Freytag-Berndt publishing firm in German-annexed Austria publishes a series of tourist maps of Europe, indicating key driving routes and features of many cities and towns just before they would become inaccessible to nearly everyone; Rohatyn appears on map number 47. 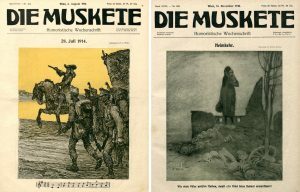 1939 Aug 31 – German agents under SS leadership dress as Polish Army soldiers and attack a German radio station in Gleiwitz, Upper Silesia (then in Germany, today Gliwice, Poland), staging the propaganda operation to appear as Polish aggression against Germany, to inflame anti-Polish sentiment at home and elsewhere. The next day, Hitler cites this and other border incidents in a speech to the Reichstag to justify Germany’s invasion of Poland – which takes place the same day, initiating World War II. Wikipedia articles in English (including “Rohatyn“ and “Ukrainian War of Independence“), and in Ukrainian (including “Рогатин“ and “Українська революція“); additional articles as linked or noted. 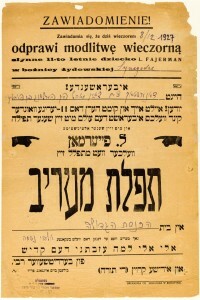 The YIVO Encyclopedia of Jews in Eastern Europe: http://www.yivoencyclopedia.org/; articles as linked or noted. Encyclopedia of the Jewish Communities of Poland (Pinkas ha-kehillot Polin), Volume II (Eastern Galicia); eds. Danuta Dabrowska, Abraham Wein, Aharon Weiss; by Zvi Avital, Danuta Dabrowska, Abraham Wein, Aharon Weiss, Aharon Jakubowicz; Yad Vashem, Jerusalem 1980 (in Hebrew). Online English version hosted by JewishGen. Pages 506~510 on Rohatyn coordinated by Alex Feller, English translation by Ruth Yoseffa Erez. Section “Between Two World Wars”. Remembering Rohatyn and its Environs; Leah Zahav, translator and editor; Fields Publishing LLC; 2015. New York Times; “Poland Repudiates Minorities’ Pact; League is Shocked”; Frederick T. Birchall; Vol. LXXXII No. 27,992, 14 Sep 1934; TimesMachine. The Landsknechts of the Galician Army; Oleh Stetsyshyn; Our Format Publishers – History; Lviv, 2012. The Bridal Canopy; S. Y. Agnon; translated by I. M. Lask; Schocken Books and Victor Gallancz Ltd; London, 1968. Raphael Lemkin; Soviet Genocide in the Ukraine; Raphael Lemkin papers 1947~1959; New York Public Library; 1953. Ukrainian regional archives in Ivano-Frankivsk; record 2.1.2039. Żydzi – Studenci Uniwersytetu Jagiellońskiego w Drugiej Rzeczypospolitej (1918-1939); Mariusz Kulczykowski; Polska Akademia Umiejętności; Prace Komisje Historii i Kultury Żydów, Nr 5; Kraków, 2004. Chronology of Mass Violence in Poland 1918-1948; Jean Yves Potel; Mass Violence and Resistance – Research Network; Sciences Po; 2010. Yahad – In Unum Interviews with Rohatyn Holocaust Witnesses; Yahad – In Unum witness research in Ukraine; 2016. Ritual slaughter and animal welfare in interwar Poland; Eva Plach; East European Jewish Affairs; Vol. 45, No. 1, 2015; p.1~25. See also: Dziennik Ustaw Rzeczypospolitej Polskiej 1936/29/237; Dziennik Ustaw Rzeczypospolitej Polskiej 1936/70/503. Polin Studies in Polish Jewry, Volume 12 – Focusing on Galicia: Jews, Poles, and Ukrainians 1772-1918; Israel Bartal and Antony Polonsky, eds. ; The Littman Library of Jewish Civilization, Portland, Oregon, USA; 1999. Polin Studies in Polish Jewry, Volume 26 – Jews and Ukrainians; Yohanan Petrovsky-Shtern and Antony Polonsky, eds. ; The Littman Library of Jewish Civilization, Portland, Oregon, USA; 2014.